Pizza Hut is organizing a ‘Chef’s Table’, a series of events planned for food connoisseurs. The Bangalore event for consumers and bloggers is scheduled to be held on Sunday, Oct 10, 11.30am – 3pm at the Pizza Hut restaurant in Forum Mall, Bangalore. Chef’s Table provides food connoisseurs an opportunity to share and enjoy recipes using fine, flavourful and natural ingredients that Pizza Hut is known for. 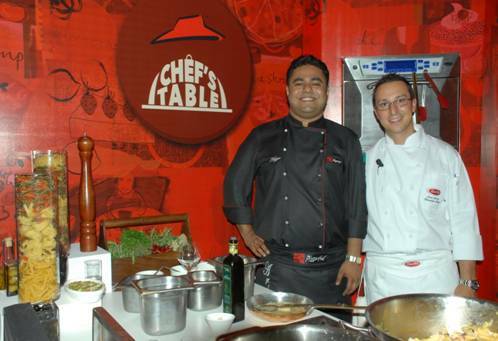 For this event, Pizza Hut’s Head Chef Arjyo Banerjee specially invited Chef Luca Ciano, who flew down from Italy to be a part of the event. Chef Luca is the Executive Chef from Barilla, Italy. Barilla is today one of the top Italian food groups, a leader in the pasta business worldwide. Chef Arjyo partnering with guest Chef Luca will create an elaborate lunch spread focusing on their finest range of ‘Tuscani Pastas’ as well as tantalizing appetizers, sinful desserts and refreshing mocktails and sangrias – all inspired by Tuscan cuisine, which is known for its fresh and flavorful ingredients cooked simply.